We’re screwed. That’s the bad news. We have designed our networks to be open and we’ve traded robust (and performance-slowing) security for speed–and that means our systems are permeable. As they were intended to be at inception. The good news? Anyone else getting in and trying to find Internet routes to break the infrastructure of the United States is screwed worse. The inherent American need to tinker, haphazard and undocumented non-standard systems, myriad patches, and hardware modifications make our major infrastructure systems such as power grids and other utilities [unintentionally] highly impenetrable to non-local bad guys. A catastrophic total shutdown of everything from Banks to traffic lights is highly unlikely. John McClane can take a break. 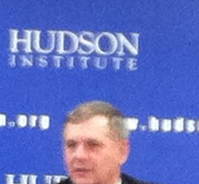 General James Cartwright (USMC, ret) shared the state of national security and cyberwarfare in Washington D.C. February 13, 2012. I took my seat at a think tank in the nation’s capitol as Cartwright spelled out the technical environment and national priorities he found most important as one of the nation’s top Cyberwarriors. Cyberwarfare is tied to economic warfare and as technology has driven more capable global commercial links, security threats have evolved as fast even as enterprising old-school espionage thrives. The scope of U.S. national cyber security over 10 years has morphed from being basically pure technical and military in nature to trying to control threats aimed at E-commerce, a driving force of the economy, and cyber espionage. In a few cases it may have been part of pro-active strikes similar to the Stuxnet attack on Irani nuclear infrastructure. Adapting law to the Internet/info age is now a critical part of this, an ongoing national project. An evolving globally linked society and threats are realized as unavoidable consequences of this push by technology–and old laws, old pre-wired ways of thinking, don’t fit. This entry was posted in Privacy_Security _Concerns and tagged AT&T, Bruce Willis, Cartwright, centrifuges, China, cisco, Community Studies, current events, DC Metro, Die Hard, Egypt, fiber optic, flame, gateway, google, hacking, Information Awareness, iran, James Cartwright, macafee, MacBook, Macintosh, Mohawk, Narus, Native American In The City, norton, NSA, offshore, Poindexter, RSA, Russia, servers, siemens, stratford, Stuxnet, UCSC, Washington DC. Bookmark the permalink.